December always seems to go by at high speed. There is so much effort expended preparing for one day. I meant to post more often but 'whoosh', the month flew by. We have tried to keep things simpler this year. We put out less decorations. 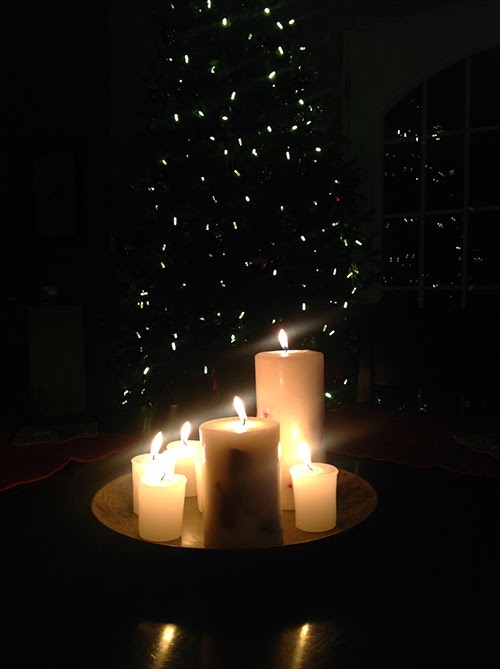 (The photo shows a simple but beautiful candle arrangement Chloé made for our table, with our tree in the background.) We bought less things although the pile of gifts under the tree still seemed monumental. We have shifted our traditions over the years as our family changes. We still eat tourtière on Christmas Eve to honour my husband's Quebec traditions although I now make both traditional meat and vegetarian tourtière as Emma is a vegetarian. In honour of my anglophone traditions, we open our gifts on Christmas morning. In Quebec, it is more common to open gifts just after midnight on Christmas Eve. We used to have a turkey dinner on Christmas Day which is what I always ate growing up. But cooking a turkey for a family of four, actually three since Emma doesn't eat it, made less and less sense. The past couple of years, we have eaten 'raclette', a traditional Swiss meal. No Swiss heritage here but it works for us. We put out plates of potatoes, cheese, vegetables (this year--green beans, asparagus and cauliflower), pickles, cured meats and marinated tofu. We sit around our round kitchen table right beside our Christmas tree. We light a fire in our fireplace. Each person chooses and cooks exactly what they want on a small communal raclette grill. We cook, we eat, we chat. It is perfect. I hope you are enjoying your holidays whatever your traditions. May you find pockets of peace and joy in all of the bustle. I won't be posting again until the New Year so I will take this moment to thank you for your friendship and to wish you all a beautiful new year! I am having a Boxing Day Sale in my Etsy Shop. I am offering 20% off all purchases (prints, cards and original paintings) when you use the coupon code BOXINGDAY. It is effective now until midnight on December 29th. All orders will be mailed during the first week of January. Your updated Christmas traditions sound wonderful. I love the look of dancing gold your Christmas tree projects. Beautiful! May you have a most blessed 2014. Dear Kathleen - sounds wonderful at your home with your Christmas traditions. I know my family did less and tried to keep it simpler too...sometimes one just has to tweek things a bit to fit the life changes. Take care and have a Happy New Year. Looking forward to seeing all you will be doing with the coming year. No way ! We've eaten raclette for Christmas too ! So easy & so yummy ! Sending you warm hugs as we're slowly but surely reaching the last days of the year.